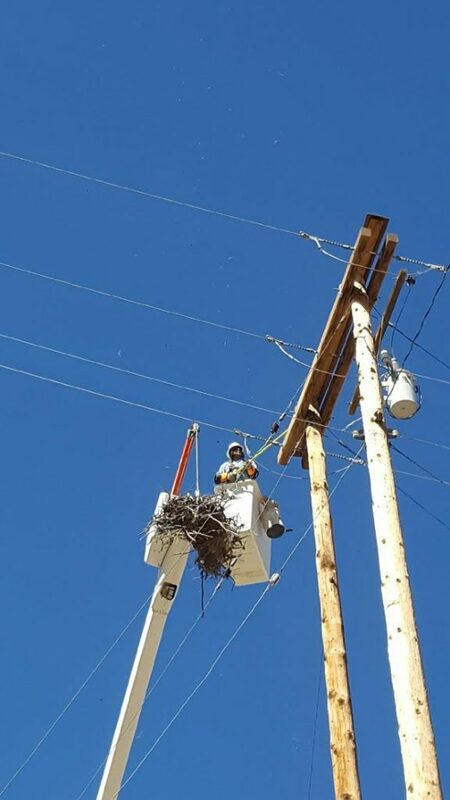 Earlier this month the Farmington Electric Utility System partnered with a number of other agencies to successfully relocate existing nests of Osprey near Navajo Dam and create safer artificial nesting sites. The project stands to create a ripple of positive effects—successfully creating a safer environment for birds and humans, as well as allowing for better service to be delivered to subscribers throughout the area. Below, environmental scientist Aaron Dailey of Farmington Electric Utility System unpacks the importance of this project. 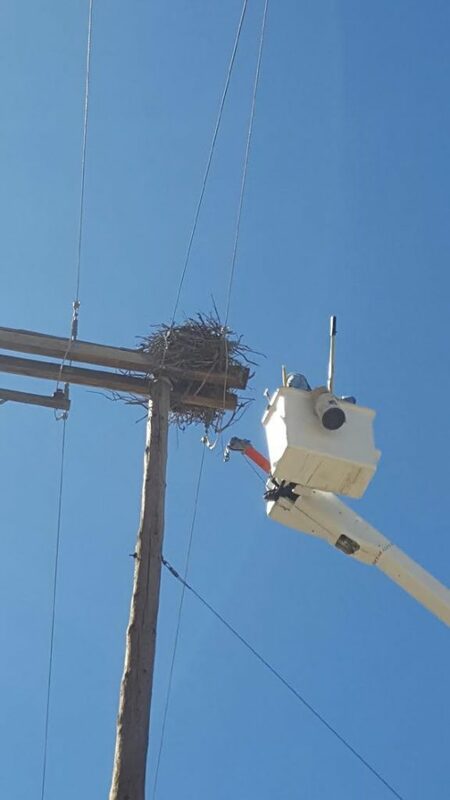 Dailey: We have been seeing an increase in Osprey breeding pairs coming in to the Navajo Dam area and trying to build nests on FEUS (Farmington Electric Utility System) energized powerlines … It has been difficult to remove nests [and] reduce the birds’ and human linemens’ risk associated with dealing with these large nests. Pole fires have become a frequent problem due to [them]. 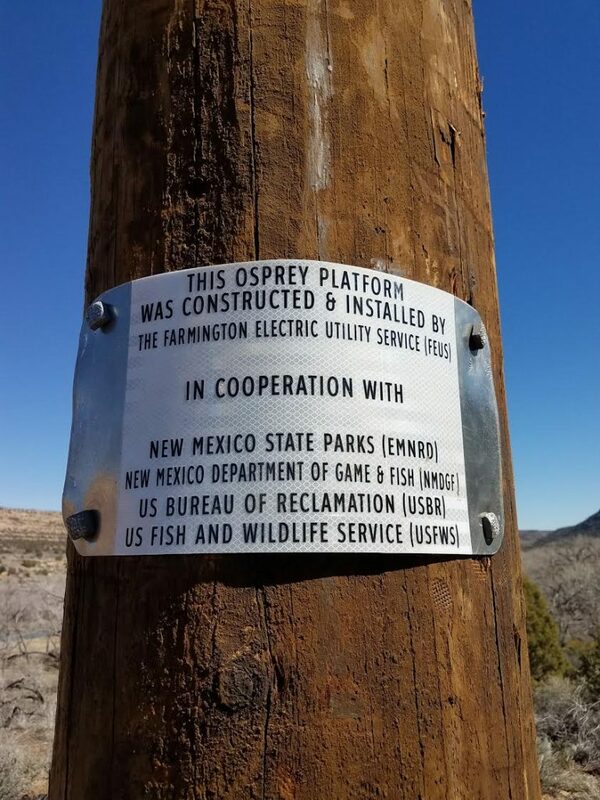 We had one platform installed at the base of Navajo Dam, so last year, we decided to get a wholesale project going in earnest to prevent Osprey from building nests on FEUS power poles and associated equipment. We strategically planned the locations to be more attractive and higher up than the existing nests in hopes [of] luring the birds to the alternative platforms. 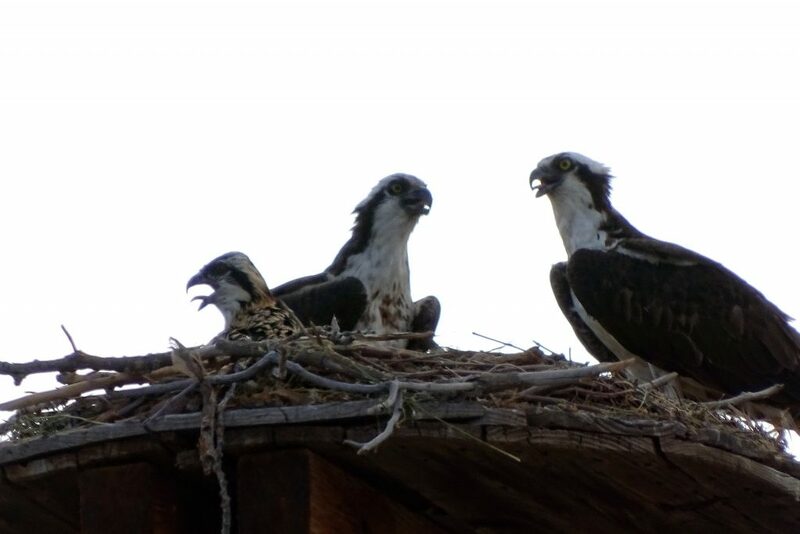 Working with Navajo Dam State Parks, USBR (US Bureau of Reclamation), and NMDGF (NM Department of Game and Fish) we were able to set up a well-coordinated project plan and execute this plan prior to the migratory Osprey returning in spring 2017. What were your specific concerns when it came to these birds and their choice of nest? Will the Osprey prefer the alternative platforms and cease building nests on FEUS poles/equipment? Will this increase the population of Osprey such that new breeding pairs that survive and reproduce [will] be an issue down the road? What is the carrying capacity and did we plan the proper amount of alternative platform locations to provide for this? Can we maintain the continued level of inter-agency cooperation to monitor and prevent Osprey from building nests on FEUS poles and ensure they nest on the alternative platforms? We also ensured that the platforms and materials used will withstand several decades of use. What was the process like from surveying until completion? It took about a year from start to completion. This was mostly [to] ensure that all agency needs were met and approvals through all agencies were obtained. A detailed project plan was provided, conference calls were planned and conducted, site surveys were done, then the big event–where we showed all the FEUS management, agency stakeholders, representatives, and [other] interested parties how we were constructing these platforms–occurred on March 9, 2017. Everyone got to help build one [and] felt a sense of accomplishment and inclusion, [as well as gained an understanding of] how sturdy and well-built these platforms are. The USBR wanted to ensure that they could continue to perform dam maintenance activities. At first, the USBR did not want any platforms installed in the Primary Jurisdiction Area because they felt that they had been admonished one time by USFWS as they were performing maintenance activities too close to an Osprey platform. Through discussion with USFWS PhD level biologists and other agency members, the USBR allowed for two alternative platforms to be installed in the Primary Jurisdiction Area, as this was agreed by all to be the best management practice here. How do both birds and humans stand to benefit from this project? This will reduce the birds’ risk of being electrocuted. They will be able to have nests that will not be removed once they take to the alternative platforms. FEUS ensures compliance by not moving nests once these nests are active, so pole fires are less of a concern at this point. Also, FEUS linemen will not have to risk going up and battling pole fires, risking their safety by going up … to remove old nests, etc. The strategically placed nest platforms can be viewed easily by the public at a distance, which should interest birders that visit NM State Parks. One alternative nest platform is located right by the Navajo Dam Marina Visitors Center. It is a win-win for all. What do you think was particularly exemplary about this mitigation? The level of cooperation from State Parks, NM Department of Game and Fish, US Fish and Wildlife Service, and the US Bureau of Reclamation was outstanding. We were able to pool our resources in order to make this mitigation a success and save money along the way. State parks was able to do the cultural surveys, and USBR was able to the environmental assessment, and FEUS was able to donate the labor and platform hardware in order to save money, time, and effort overall. What is the current status of these nests? We have six alternative Osprey platforms installed and ready for Ospreys to inhabit. Where there were existing nests on FEUS powerlines, these have been removed and placed on the new alternative Osprey platforms. What do you hope others stand to learn from your work on this project, and in other similar projects? That through cooperation and collaboration these projects are possible and everyone wins, especially the birds. For more background on this project, check out the coverage provided by the Farmington Daily Times below or download a PDF of the article here. upon it on Yahoo , I’ll return once again.